Before I tell you how cute this new line of Book Worm labels from Lovable Labels is, I want to let you know that the Lovable Labels company has the nicest, most thoughtful team of people to work with! I have no doubt that should you choose to order from them, you can expect to receive the highest level of customer service and satisfaction. I really appreciate knowing things like that about a company before I order from them, so I thought I would make sure I expressed that to you, too. 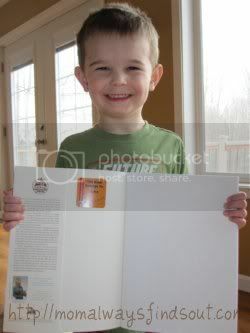 My son, Luke, was recently presented with a package of Lovable Labels Book Worm labels personalized just for him! As you can see in this photo, he has definite pride of ownership in his new book. And I’m glad that we can take his books out and about with us to play dates and such without worrying his book will get lost, never to be returned. Would you like to learn more and/or make a purchase? Lovable Labels are sold online, so you can order anytime, from anywhere in the world! As we all know, children tend to lose stuff – make sure it comes home by using Lovable Labels! Check out the Lovable Labels website and see all of the different label possibilities. They have labels for everything from clothing and shoes to sippy cups, bag tags, allergy labels and much more. They even have special teacher organization packs, toy bin labels, pantry & spice labels and such for your household needs. 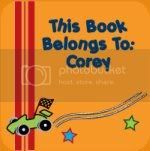 BOOK WORM Label Package Giveaway! 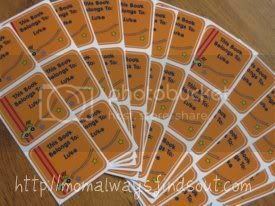 Lovable Labels would like to give one lucky reader a personalized set of Book Worm labels. This giveaway is open to both USA and Canada residents ages 18 and up. Contest ends May 22 at 11:59pm PST and winner will be randomly selected using WP Plugin “And The Winner Is.” I will e-mail the winner, who will have 48 hours to respond and claim their prize. 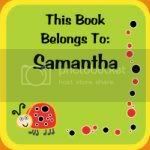 MANDATORY ENTRY: Leave a comment naming the set of Book Worm labels you would choose if you are the lucky giveaway winner. *Add this giveaway to any giveaway linky and comment here to let me know where I can find it. Disclaimer: I received a set of Book Worm labels free of charge for review purposes. The opinions expressed in my review are honest and my own, based on my personal experiences with the product and not influenced by monetary compensation. Congratulation by the way on Baby #4! 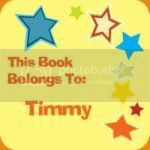 Thank you posting your beautiful pictures and review on our Book Worm Label Pack. They look amazing! Thanks again and we just can’t wait to find out who wins! I love Book Worms-Spot Studio set! They would be perfect! I would choose an ultimate camp pack of labels. I like loveable lables on FB as Charity Lo Giudice. I like you on FB as Charity Lo Giudice. I follow you on GFC as Charity and John. I would choose the Book Worms-Spot Studio. I like Lovable Labels on FB! I like Mom Always Finds Out on FB! I like the toy bin labels! I would choose the skulls & stars! I would choose the Spot Studio or the Lady Bug-a-roo…they are all so cute! I like the skulls and the circles. Spot Studio for my daughter. I like the Spot Studio but my daughter LOVES ladybugs so I imagine I would choose the Lady Bug a roo for her. She has tons of books and loans them out to friends all the time. Like Lovable Labels on FB as well. Follow you on Twitter too.